When it comes to providing access to dental care for our kids, Minnesota should be too embarrassed to smile. Our state currently ranks at the bottom of the pack – 49th of the 50 states – when it comes to the Medicaid payment rate for pediatric dental services. Unfortunately, we’re not doing much better when it comes to helping adults access dental care. Minnesota is also near the bottom – fourth worst – in the payment rate for adult dental care services. Because of the current low payment rate, many dental clinics – especially small clinics and clinics in Greater Minnesota – cannot afford to serve low-income patients, contributing to our state’s access crisis where low-income patients with serious dental problems cannot get the treatment they need. Supporting “Help Minnesota Smile” means significantly improving access to critical dental care services across Minnesota. Improving dental access is both the right thing to do and the fiscally smart thing to do. Better access to dental care means fewer emergency room visits, which will save taxpayer money for uncompensated care. The cost of dental-related visits to hospital emergency rooms in Minnesota has been estimated at over $150 million over a three-year period. Join our effort! Click here to email lawmakers and encourage them to Help Minnesota Smile. Why Aren’t We Smiling Now? Minnesota currently ranks at the bottom of the pack – 49th of the 50 states – when it comes to the Medicaid payment rate for pediatric dental services. Minnesota is also near the bottom – fourth worst – in the payment rate for adult dental care services. 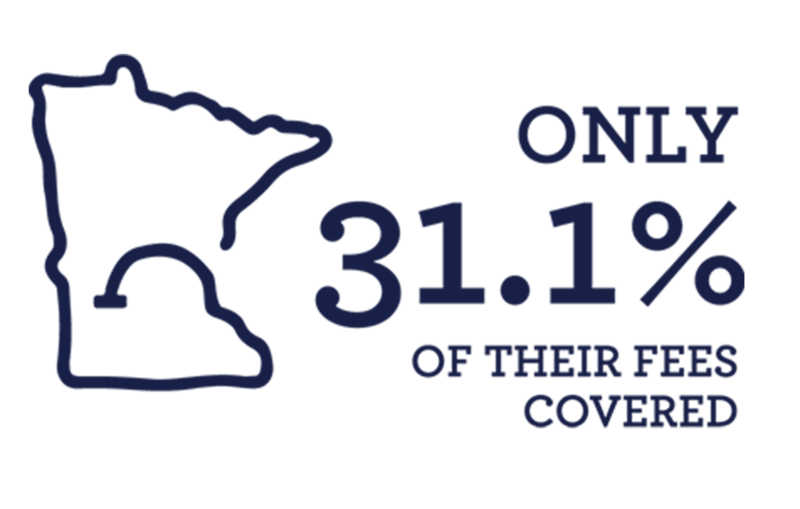 Because of the low payment rate, many dental clinics – especially small and rural clinics – cannot afford to serve low-income patients, contributing to Minnesota’s current access crisis where low-income patients with serious dental problems cannot get the treatment they need. Moving Minnesota from the bottom of the pack to the average among the states would cost approximately $100-$120 million over the upcoming two-year biennium (FY 18-19). The state’s General Fund spending for FY 18-19 is projected to be approximately $45 billion, making the state funding request less than 0.3% of the state budget. The proposal would not increase eligibility, rather it would focus on providing additional funding to increase dental care access, which is particularly needed in Greater Minnesota where two counties currently have no dentist and several have dentist ratios of 1 dentist per 10,000 residents or 1 dentist per 5,000 residents. Better access to dental care will mean fewer emergency room visits which will save taxpayers money for uncompensated care. The cost of dental-related visits to hospital emergency rooms in Minnesota has been estimated at $148 million over the past three years. We need your support today. Take the pledge to help us ensure that lawmakers, state agencies, and the Governor are thinking about the 1.2 million people who need our help to access the care they need. I support raising Medicaid reimbursement rates for dental services. Send me updates on this issue.